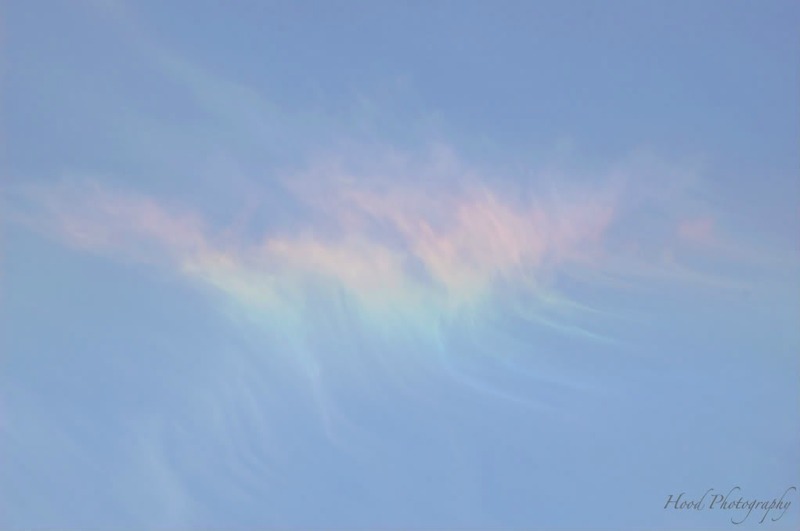 Rainbow clouds are also called sun dogs, and are made of tiny ice crystals, and if the cloud is at the right angle to the sun, the crystals will refract the sunlight (much like a prism) into the colors of the rainbow. So it's very similar to a regular rainbow when it's raining, only a little more rare. How Glorious He makes things! Oh, what a terrific capture! Love those soft colors! Happy SWF! Have a wonderful weekend, Sarah! Beautiful whisper of a rainbow! Delightful photo. Congratulations on capturing a shot of the rainbow cloud. Not only is it a rainbow, but it's dancing as well! Far from human sight and seeing? OH! This is amazing! What a capture!! Is that what they call a 'sundog'? I've never seen such marvelous thing till I landed here. That is a very beautiful sun-dog! We see then very seldom here. Great catch. What a pretty cloud, great sighting. Happy skywatching and have a great weekend! Fantastic! I saw one of these once, in Mississippi of all places, as I was driving west on I-20. It lasted for quite a few miles, way up high. I didn't know about such clouds. It is like a delicate sea creature. I like such 'empty' photos too.